Students in several schools throughout the Caribbean will soon be able to benefit from an intensive marine curriculum as part of a partnership between the Sandals Foundation, the Guy Harvey Ocean Foundation and CARIBSAVE (INTASAVE Caribbean). Dubbed the Save Our Seas Program, the initiative was launched recently in Ocho Rios, Jamaica. The program will be implemented in 40 schools across the region with an emphasis on developing marine awareness and environmental stewardship. According to Sandals Foundation Director of Programs Heidi Clarke, the initiative represents the framework for a culture shift in environmental awareness. “The people of the Caribbean have relied on the ocean for centuries but have never necessarily grasped the impact they have on its wellbeing. By teaching the next generation to understand how their actions affect the marine ecosystem and give them ownership of its wellbeing we can hopefully make a much-needed change”. Some of the features of the year long program will include marine awareness videos, posters, lesson plans, activity books and competitions. The specific lesson plans will be targeting students in grades 6-8 and have been designed to be interactive and engaging as well as informative. The topics that will be covered include; Coral Reefs and Protecting Our Oceans, Creatures of the Sea — Marine Mammals and Sharks, Sea Turtles and Coastal Ecosystems and Climate Change. CARIBSAVE (INTASAVE Caribbean) is a regional nonprofit organization whose mandates include sustainable development and climate change. The organization has made tremendous strides in disaster mitigation and coastal vulnerability reduction throughout its existence and views the initiative as an extension of its overall push for environmental sustainability. Patron of the program Dr Guy Harvey is a Jamaican marine wildlife artist and conservationist. His illustrations of sea life have been reproduced in prints, posters and clothing worldwide. Guy Harvey’s Portraits from the Deep is a syndicated television series that combines the showcasing of sport fishing destinations with educational information from marine scientists. He has championed ocean conservation for many years and is a recognized authority on the discourse both regionally and globally. Dr Harvey’s esteemed endorsement of the program is not lost on the other organizers. 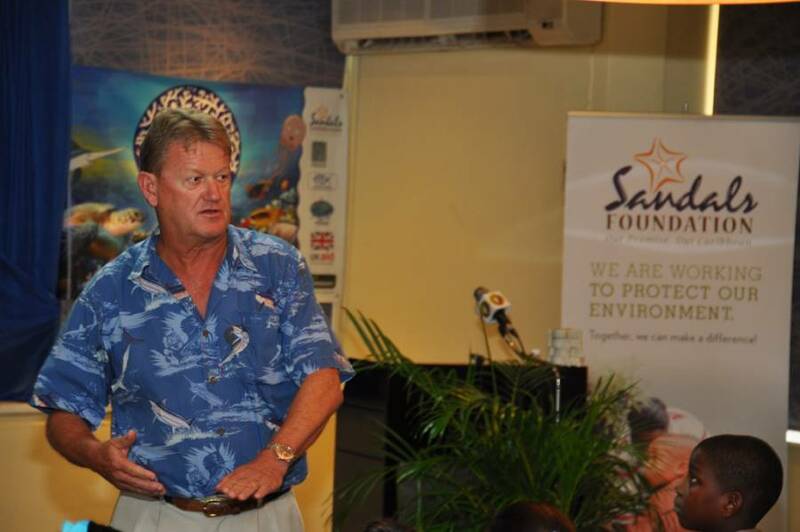 “Guy Harvey is an acclaimed conservationist and a true son of the Caribbean” says Sandals Foundation’s Clarke, “…having him onboard with this program really injects a degree of creativity and innovation the children are sure to be attracted to and they’ll certainly be kept engaged throughout its entirety”.